DC is one hell of a place to seek specters out. Proof of the supernatural may be, um, hard to come by, but given all the major historical events that have gone down in the area, it’s not super surprising that folks sometimes hear muted yells at Bull Run, or that apparitions have been seen along the Mount Vernon Trail. Hauntings in DC tend to have backstories that are relevant to our entire country, and we’ve rounded up some of the most remarkable of the city’s stories. Before President Lincoln was assassinated in Ford’s Theatre, conspirators had begun meeting at Mary Surratt’s boarding home on H Street NE, between 6th and 7th Streets NW. Between November and April 1865, they plotted to kill and wound multiple VIPs in the federal government, but of course, John Wilkes Booth’s assassination of President Lincoln during a performance of Our American Cousin was the act that changed the course of our country. Some of the conspirators were later caught or killed, and on July 7th, 1865, Ms. Surratt infamously became the first woman executed by the federal government -- it was ordered that she be hanged from the neck until dead. Mary Surratt's now houses a Chinese restaurant, but remains the home of her ghost. From her death onward, occupants of the building have claimed that Surratt's spirit is responsible for the building’s many mumblings, whispers, footsteps, muffled sobs, and creaking floorboards. Judge Joseph Holt famously presided over the trial of the Abraham Lincoln’s conspirators, and sentenced many of them to death by hanging. They say that sentencing a woman, Mary Surratt, to death powerfully affected Judge Holt. He became a recluse following the trial, and local residents have claimed to see his ghost walking towards the courthouse on cold, autumn nights. Many former occupants have been seen or heard around the building, including Thomas Jefferson, who has been known to play his violin in the Yellow Room; Andrew Jackson, who can sometimes be heard laughing in the Rose Room; and both John Tyler and Frances Cleveland, First Lady to Grover Cleveland, who have appeared in the Blue Room (separately, and without candlesticks). Abraham Lincoln’s presence has been felt by former occupants as well, including several First Ladies, Presidents, and their respective pets. 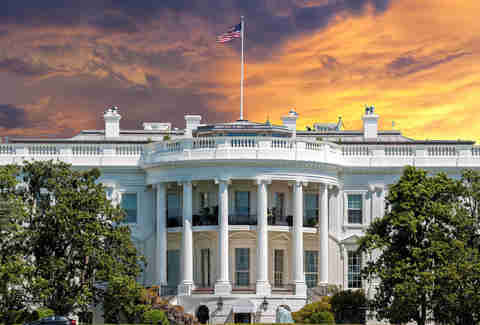 Non-residents who have appeared around the White House include David Burns, who owned the ground that the White House was built on and sold it to the federal government and can occasionally be observed in the Oval Office; a British soldier, dressed in attire from the War of 1812, who has been observed carrying a torch throughout the building; and the daughter of Mary Surratt, who is rumored to have pled for her mother’s life following the conspiracy to assassinate President Lincoln, who can be heard banging on the front door. The Demon Cat of Capitol Hill has made its way around the White House, too. The cat allegedly appeared on the White House Grounds just before the assassinations of Abraham Lincoln, Garfield, McKinley, and Kennedy. But supposedly, following the failed attempt on President Reagan, the cat has stopped coming around entirely. The spirits of many people haunt the square, and for good reason: it was a notorious slave market in its day; the former Williams Slave Pen and Robey Slave Pens, which are currently occupied by lobbying groups, are quite close by. On dark nights, the clanking of chains and the screams of people can be heard. 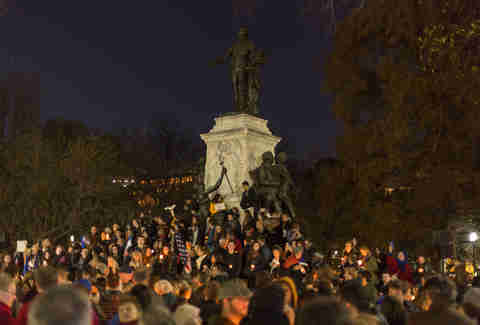 Richard Key, the son of Francis Scott Key, was also shot by Daniel Sickles in the square; he died later that night, but can sometimes be seen wandering near the spot where he was shot. This building has served many functions over the years. 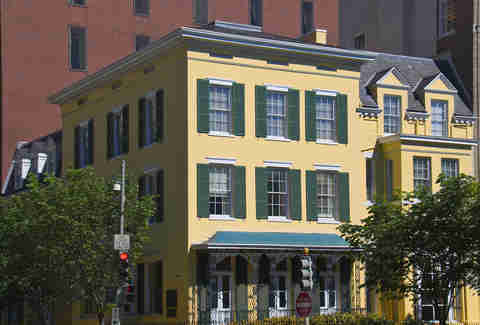 It was the home of presidents and vice Presidents (after the White House was burned down, James and Dolley Madison stayed here while the Downtown quarter was rebuilt); served as a tenement, following the absence of well-to-do owners; and a school for young girls, after a cloister of nuns took over. It was untended, but not completely derelict, before it was purchased by the American Institute of Architects in the early 20th century. Through all that history, it is rumored to still be haunted by its original inhabitants: Colonel John Tayloe, of one of the noted Virginia families that made their money as planters, and two of his daughters. Strangely, both of the girls died just before or after eloping with men their father disapproved of, and both of them fell down the house’s remarkable stairwell to their deaths. The first intended to elope with a British officer, but her death cut that dream short; the second managed to elope with a young local boy, but when she attempted to reconcile with her father, she suffered the same fate as her sister. Staff and visitors to the house can hear a woman’s shriek toward nightfall, and later residents, as well as some visitors of the Madisons, reported seeing a woman’s body, crumpled at the foot of the stairs. 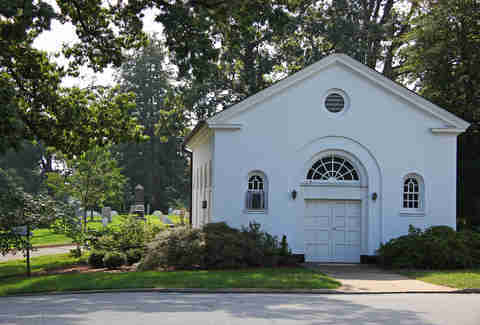 This military chapel, adjacent to Arlington National Cemetery, is where the majority of funerals that take place in the cemetery begin. Considering that over 400,000 soldiers have been buried here, there is a significant presence from families who have experienced loss and buried loved ones, and the space has a continuous importance as hallowed ground. However, with all this history, there’s bound to be a few hauntings. Soldiers stationed here will often talk to the tomb’s guards or local MPs, and hear about strange occurrences. For instance, a lady in red can be seen walking through the cemetery, lost, as though she’s looking for the grave of someone close to her; the clip-clop of horses can occasionally be heard on overcast evenings, despite all burials taking place during the daytime; and an apparition can be seen in one of the anterooms, kneeling in prayer, likely for a fallen soldier. 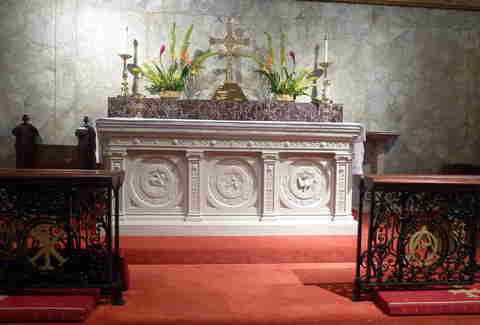 Once observed, the apparition’s lit candles blow out. A lot of people have died working in the US Capitol Building, including representatives like Joseph Cannon, Wilbur Mills, and Champ Clark; government officials like Vice President Wilson, John Quincy Adams, and James Garfield; and officers who served in the armed forces, like General John Logan and Pierre L’Enfant. Many workers also died during the Capitol’s strenuous and complicated construction process, too. If any of these folks have a right to haunt the place, it’s the latter group -- and who’s to say they’re not? The most sympathetic US Capitol apparition is said to appear on the ceiling, then reappear almost immediately below, at ground-level, mimicking how he fell during construction of the rotunda. Another worker, a stonemason who was crushed to death between collapsed walls, can be seen passing through these same walls while roaming the area. 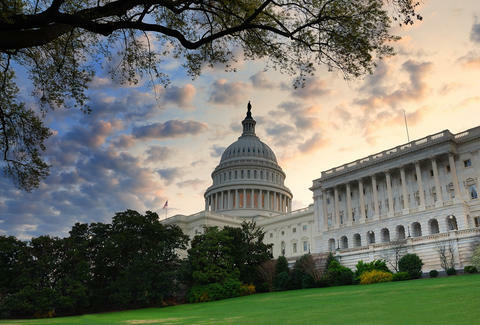 However, the Capitol building is perhaps more famously haunted by the representative ghost of a clowder of black cats that lived on Capitol Hill. Prior to the construction of the US Capitol Building, the area was cleared out by hired hands, who were hired in part to kill the cats. Many of them were allegedly wiped out with shovels and pickaxes to allow for easier construction. After this, a single cat apparition, now labeled the Demon Cat of Capitol Hill, can be seen by those walking the streets of the neighborhood late at night. The Demon Cat has been said to often appear to security guards, and legend has it that if you don’t run from it immediately, the cat will pounce at you, transforming into a panther... then vanishing right before it lands. The church’s bell, weighing a remarkable half ton, was purchased from the Revere Company of Boston, founded by the son of Paul Revere. It was installed on November 30th, 1822, and supposedly, when a notable person dies and the bell tolls, six ghostly men in white robes appear in the President's pew at midnight... then vanish into thin the air. It’s unclear who they may be, but they always pay their respects at the location also known as Tragedy Square. Stephen Decatur, a 19th-century American war hero, managed to avoid dying in battle, but couldn’t avoid being mortally wounded in a duel with Commodore James Barron, a man he insulted. Actually, this situation really could have been avoided, but old-school rules around honor, vengeance, being what they were, Decatur was brought home, where he was heard to cry out, "I did not know that any man could suffer such pain," before dying at 10:30 that evening. His pained screams can still occasionally be heard around the time he died. This home was constructed in 1822 by Richard Cutts, Dolley Madison’s brother-in-law. Mr. Cutts and his wife Anne lived in the home until Mr. Madison purchased it from them. Following Mr. Madison’s death, Dolley moved into the home to cut back on expenses, and was visited by every president from James Monroe to John Tyler, and other members of the Washington elite. Montpelier, owned by the Madison family, had become overwhelmingly expensive to maintain, and nearly left Mrs. Madison in ruins. She attempted to save the property by moving back to set the finances in order, but she ultimately failed, and returned to the home along Lafayette Square, where she stayed until her death. Her son, John Todd, inherited the home, and over time, it has passed through several hands, but several residents -- from the mid-19th century on -- claim to have seen Mrs. Madison’s ghost, rocking in a chair, hanging in the space where the porch once was. Thomas J. Walsh had emigrated penniless from Ireland to the United States in 1869, but over the next quarter century, built up a small fortune as a carpenter, miner, and hotel manager. In 1908, his daughter, Evalyn married Ned McLean, the heir to the Washington Post fortune. After her father's death in April 1910, the couple lived in the Walsh Mansion until Evalyn’s death in 1947, but to cover the Walsh debts, the home was eventually sold to the Government of Indonesia for use as an Embassy. According to its current residents, Ms. Evalyn can sometimes be seen gliding throughout the home, especially around the central, grand staircase. 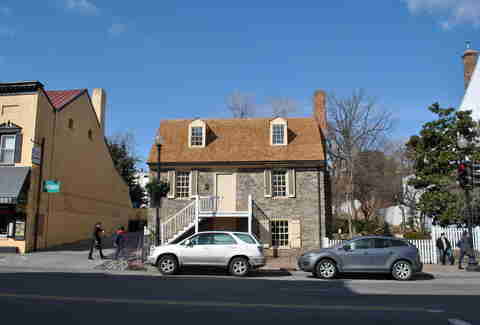 Standing since 1765, this is the oldest unchanged home in Washington, DC. It has changed hands many times, and served as the housing for tailors, haberdashers, and Andersen car dealers. The federal government purchased the building in the 1950s and has preserved it, but hasn’t managed to keep it free from wandering spirits: over time, a number of strange incidents have been observed at the home, including the sudden sound of children laughing, and apparitions of women cooking in the kitchen. Certain points in the home leave visitors feeling an intense chill throughout their body, even during the height of summer, and most terrifyingly, a malevolent spirit, nicknamed "George," assaults visitors, usually choking or pushing them, and leaves everyone he meets with an intense feeling of dread. Pass by this old house, and you may notice that strange things start to happen as the sun sets. This house, completed in 1785, lies at the southernmost point of Alexandria on the current corner of Washington and Oronoco Streets. It’s best known as the boyhood home of Robert E. Lee, but the primary owners and residents were Major General Henry Lee and successful land-owner and banker, Philip Fendall, both related through the Lee Family. The home saw its most tumultuous time during the Civil War, when it was initially leased to a northern banker and ultimately seized by the Union army for use as an adjoining building for the Grosvenor hospital. This was done when the Lees reportedly refused to swear an oath of loyalty to the federal government. During its time as a hospital, soldiers were treated, operated on, allowed to convalesce, and if they didn’t survive -- were placed in a morgue toward the back of the property. Almost 40 members of the Lee family lived in this home, but it was ultimately sold out of the family in the early 1900s, and is now a protected historic site for which limited tours are available. However, if you’re in Alexandria late at night, it’s said that soldiers, women, and children in period clothing appear on the back stairs toward the back of the property... yes, by the makeshift morgue that was set up during the war. John Adams, James Madison, and Thomas Jefferson are among those who frequented the tavern. It also was one of the first places a crew docking at the Potomac Canal could stop for food, drink, and a room for the night. This tavern is notably haunted by “The Female Stranger,” a woman who, along with her husband, arrived from abroad and rented a room in the hotel. She fell deathly ill, and local physicians couldn’t save her. Her identity was never revealed, and the inscription on her gravestone, located in nearby St. Paul’s Cemetery, simply reads, “In memory of the female stranger, died October 14, 1816, age 23 years 8 months.” Following her burial, her husband left Alexandria and his debts for the room, medical care, and burial cost. Now when visitors are near the tavern, a woman can be seen holding a candle... and when one stays in the tavern late at night, her footsteps can be heard throughout the building.